“Where you stumble. There lies your treasure.” I believe it not because Joseph Campbell said it, but because it happened to me. At age 35, my running began on another’s whim. Seeing that I needed to get my mind off of that first novel that wasn’t coming together, my wife at the time informed me that a 5k was being run a few blocks from our condo, and that she’d signed me up for it. She waited until the morning of the race to tell me. I finished in 26 minutes and change…in a pair of High Tech hiking boots. That was 14 years and about a hundred races ago. At age 43, my entrance into running journalism began with no more promise. Seeing that I needed something to take my mind off of the flat race performances that come with advancing years and the discovery of one’s lower-than-hoped-for genetic ceiling, a different wife suggested I try my hand at writing an article for the local running newsletter. My first was a rant about the glut of extra large T-shirts at races: the story of a slightly-built race-day registrant with a closet full of race shirts easier to swim in than to run in. A stumble on the road to being a novelist. A stumble on the road to being a competitive Masters runner. And here I am accepting an award for which another woman, my editor Lori Hawkins, set me up. Two stumbles. Three women pointing me in the right direction. And now at races strangers inform me that they sometimes use the lines I’ve written as training and racing mantras. There lies my treasure. Thank you, Lori. Thank you, Pikes Peak Road Runners. 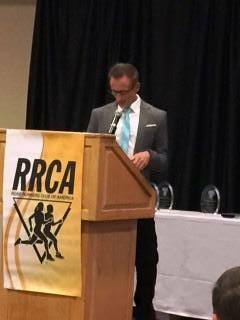 And thank you, RRCA.